I am always astounded by the types of materials that can be mixed together to make jewelry. It seems like no matter what materials you like, you can combine them together into something special. Here are some great patterns and inspiration for you. To make pretty jewellery with my crochet hook I have been looking for the perfect product to stiffen my yarn. ICE Resin can do the job! I turned a crocheted flower into a piece of jewellery in no time just by adding ICE Resin. Tip!! Like paper, the yarn will become slightly translucent if resinated. But as you can prepare your paper before resinating, you also can prepare yarn. Learn how to make this adorable DIY Leather Stitched Bracelet, and other fun projects. You will be right where you need to be to buy the supplies at a steal of a price and get creating! 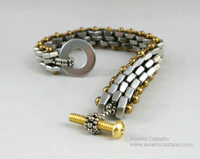 I was totally smitten with the bracelet by Aurelio Castano, and, judging from your comments, so were a lot of you! It made me think of the fun Grommets Galore bracelet project by Dulcey Heller that I made a few years ago, and as I was running errands in town one day, I thought I would wander through the hardware store and see what else I could find that could be used for mixed media jewelry. Over the years I’ve learned that amazing things can come from a humble spool of wire. Dead soft wire can be manipulated with agile fingers into swirls, loops, letters, words, organic wire beads, clasps, and more. Introduce some jewelry pliers and household mandrels into your techniques and the sizes and shapes you can create increases exponentially. Sometimes it’s just not enough to express ourselves via one art medium, so I thought I’d mix it up today by focusing on art to wear: mixed-media jewelry. Accessories are such a personal thing—our jewelry helps to define us by showing what we like, and who we are (I usually go for earth-toned beads and feather earrings, but will sport a little timeless silver for a business occasion, for example). Of course, my collection wouldn’t be complete without some leather pieces as well. 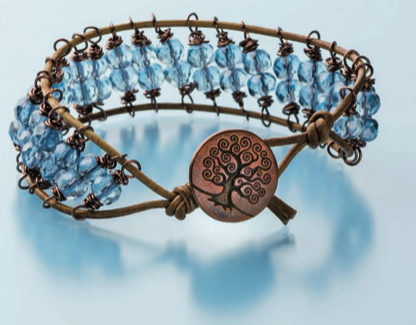 Nunn Design Innovation Team Member, Karen McGovern, created this fun bangle for our friends over at Jewelry Making Daily. By switching out the fibers and by adding different color combinations, it is easy to create one of a kind pieces sure to please everyone on your list. A brief tutorial on how to measure, cut, and seal paper for use in resin jewelry. 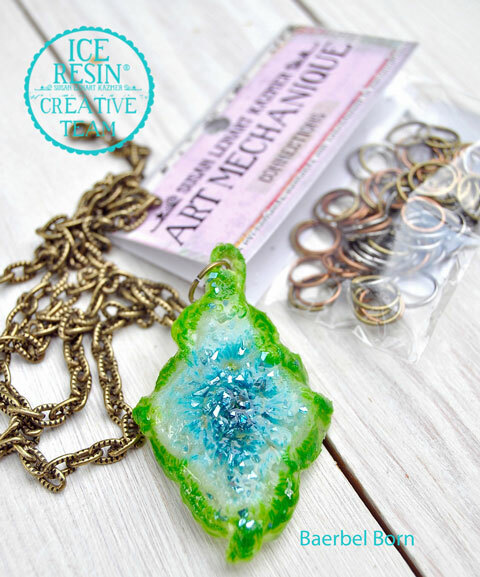 If you’d like to learn how to mixed media jewellery, including polymer clay, wirework and jewel enamel and incorporate these techniques into your jewellery making, watch our latest video tutorial….